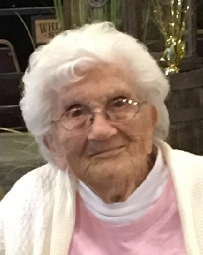 Obituary for Juanita Lucy (Cobble) Russell | McCombs Funeral Home Inc.
Juanita Lucy Russell, age 101, of Oak Ridge and better known as “Granny”, passed away Monday, August 27, 2018 at the Lutheran Home in Cape Girardeau. She was born February 2, 1917 in Cape Girardeau to George and Ruby Drum Cobble. She was married to James Russell and he preceded her in death April 27, 1969. Over her one hundred and one years she had worked as a cook at several restaurants which included the Fruitland Sale Barn, Sunnyhill, Sands, Jer’s, and Frontier Restaurant . Granny was able to continue to drive until the age of 93 and canned until she was 99. Survivors include her five children, Dean Wills of Cape Girardeau, Bill (Carolyn) Wills of Fruitland, Jim (Jeri) Wills of Oak Ridge, Phyllis Scott of Jackson, and Patricia (Wills) McCall of Oak Ridge; 15 grandchildren; 21 great grandchildren; and too many great great grandchildren to list. In addition to her husband she was preceded in death by her daughter in law, Betty Wills, her grandson Ricky James, and her sister Odessa Biri. Visitation will be from 1-2 p.m., Thursday, August 30, 2018 at McCombs Funeral Home and Cremation Center in Jackson. Funeral Service will be at 2 p.m. at the funeral home with Charlie Mangels and Steven Koerner officiating. Burial will follow at New Salem Cemetery in Daisy. Memorial contributions may be made to New Salem Methodist Church and online condolences may be sent to the family by visiting www.mccombsfuneralhome.com.